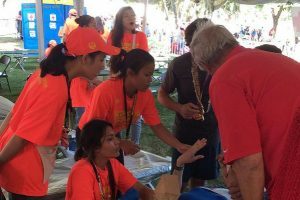 Pictured: JABSOM 3rd-year medical student Keolamau Yee, left, volunteering inside the medical first aid tent at the Honolulu Marathon. In Honolulu, people in neighborhoods along the route of the Honolulu Marathon line up along their streets to watch the runners trot by, cheering them on. But while finishing the marathon is a worthy goal, not every participant escapes without needing urgent medical attention. Scores of them walk, limp or are carried into the marathon’s first aid tent. That’s where champions in medicine can be found. In the just completed race on December 10, 2017, medical students from the University of Hawaiʻi (UH) John A. Burns School of Medicine (JABSOM) were part of the lifesaving marathon medical team. “They were extremely helpful in ‘triaging’ patients–deciding who needed what care most urgently,” said Tony Katras, a Vascular Surgeon at Straub Medical Center. He said the JABSOM MD student volunteers quickly addressed urgent problems including severe dehydration, started IV’s to rehydrate the many that needed it, and helped sufferers of heat stroke. “At least four patients had temperatures of 107 degrees! The future MDs placed those patients in a iced water “kiddie pool,” which was indeed life saving,” said Dr. Katras. He said our JABSOM students helped at least 200 patients during the marathon event. “In general they rapidly took histories, performed quick physical exams and then instituted treatment. As you can imagine, there were many severely dehydrated patients after running 26 miles, many were overheated, many had severe cramping, etc. Several runners had electrolyte imbalances. Our MD students, under expert supervision, were even able to obtain a small syringe of blood to run an ISTAT (an electrolyte blood test). All in all, they did an awesome job and fit right in with the entire medical team. In fact, the organizers of the medical team asked me to see if next year I can encourage more JABSOM students to come and help,” said Dr. Katras. “Our University of Hawaiʻi medical students were great ambassadors for UH JABSOM, so hope we can get even more volunteers next year,” said Dr. Katras. 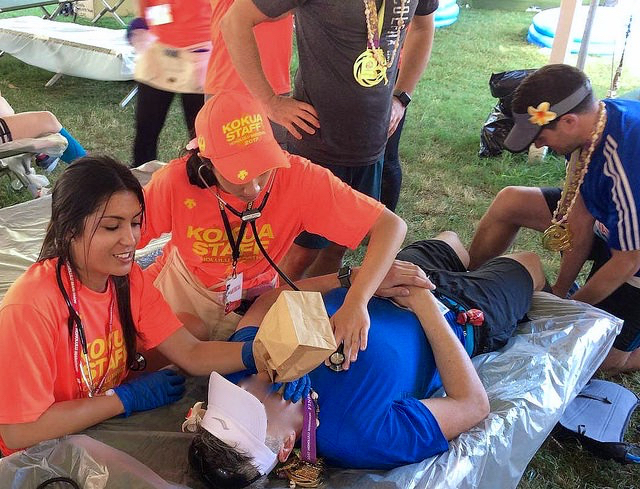 MD students and faculty gather around a patient inside the Honolulu Marathon First Aid Tent. 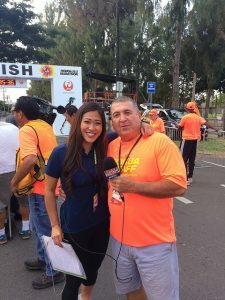 Volunteer Surgeon Dr. Katris turns the tables — er, microphone — on KITV sportscaster Brady Higa on race day. Registered Mechanical Engineer Dien Truong, P.E. completed his 20th marathon on Sunday, December 10, 2017. Congratulations to him and all those from UH-JABSOM who ran, walked or worked the race! 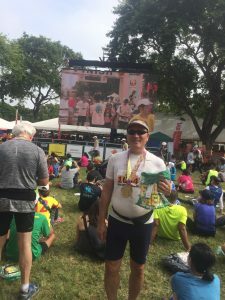 JABSOM mechanical engineer Dien Truong completed his 20th Honolulu Marathon. Did you run? Send us a photo and blurb!